The Complete Fixes for "iPhone Not Connecting to iTunes"
Most of the users, after connecting the iPhone to iTunes, complained of their iDevice not being recognized. This problem occurs when the users connect the iPhone with USB cable to the computers, but the iTunes does not synchronize properly with the iPhone. 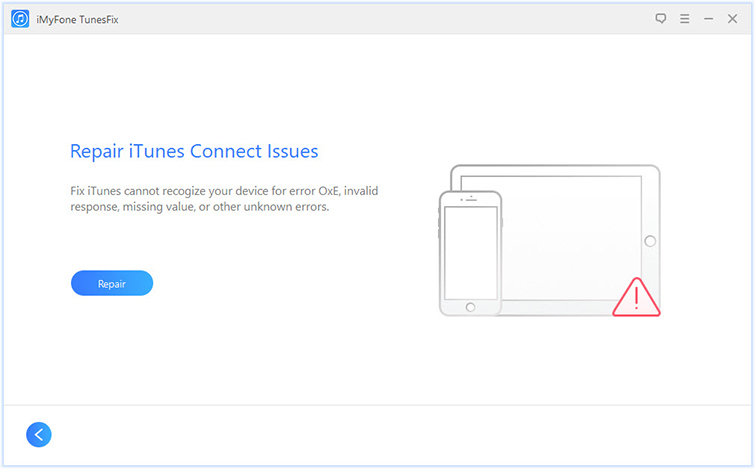 So, if your iPhone cannot connect to iTunes then refer these important steps to fix the errors. Method 3: iPhone Cannot Connect to iTunes on Mac? The Fixes! Method 4: iPhone Not Connecting to iTunes Windows? The Fixes! “iPhone not connecting to iTunes” issue is not easy for most of us to fix. Unluckily, it may be possible that this issue still can’t be fixed even you have tried many tips. If you want to save time, you should find a effective way to deal with this connect problem and it will be much easier. 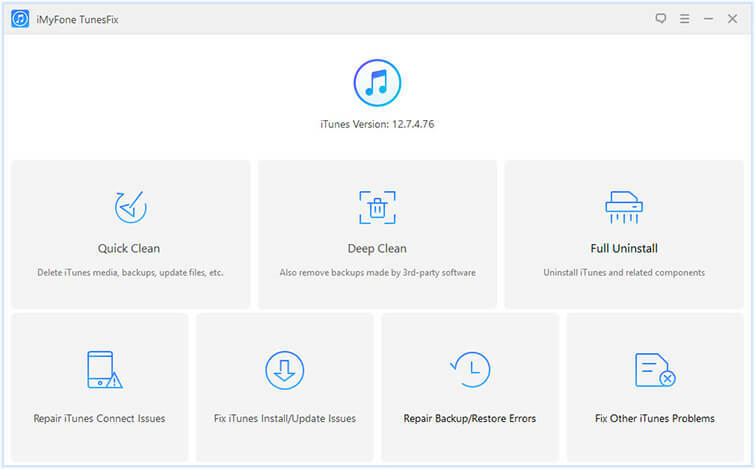 If you want to fix iPhone cannot connect to iTunes, try iMyFone TunesFix which helps not only fix connect issue, but also other iTunes problems. It is a comprehensive iTunes repair tool. Below we will show you the simple steps to fix iTunes issues. One click to fix "iPhone not connecting to iTunes" issue. iTunes data will be well-remained while repairing. Support to solve 100+ iTunes issues: install/update/restore/open/backup/slow/crash and other problems. Want to optimize your iTunes? TunesFix's cleaning function can clear iTunes to free up and boost your computer. Step 1: Install iMyFone TunesFix and then launch it on your computer. If your iTunes has component problems, it will detect your iTunes and show you the status. Then you can fix it. If your iTunes has no component issue, you can see the main interface. Step 2: Choose "Repair iTunes Connect Issues", this mode can solve all the iTunes connect issues. Step 3: Click "Repair" to start fixing the problem. Tips: If you still can't fix the connect issue, you can also try the "Fix Other iTunes Problems" mode. iMyFone TunesFix is a comprehensive iTunes optimizer which can also be used to clean and uninstall iTunes. It is easy to be used and totally safe, don't hesitate to download it and have a try. Try to follow these steps if your iPhone does not connect to iTunes due to 0xE error. You can connect your iPhone again after each of these tips. One must have the latest version of iTunes that works on your computer. Check whether you have the latest version of Windows or Mac. Make sure your iPhone is turned on. Unlock your iPhone and click Trust, if "Trust this Computer" Alert appears. Unplug all the USB accessories from computer except your iPhone. Try out every USB port with the data cable. If this does not work then try out the different Apple USB cable. Check other computer to see it’s still the same thing or not. If other computers can’t detect your iPhone, then contact Apple Support. iPhone Cannot Connect to iTunes on Mac? The Fixes! Step 1: Hold the Option key and click Apple menu. Then choose System Report or System Information here. Step 2: Select USB from the list on left side. 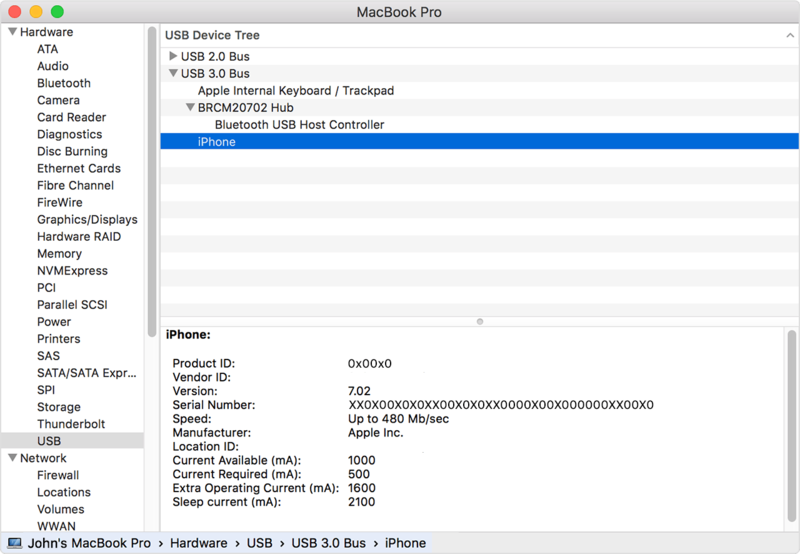 Step 3: Check you can find your device under “USB Device Tree” or not. If you see your iPhone, then uninstall third-party security software. If you cannot see the device, contact Apple Support. iPhone Not Connecting to iTunes Windows? The Fixes! Step 1: Disconnect your iPhone from PC. Step 2: Reconnect your iPhone. If iTunes opens automatically, then close it. Step 3: Hold down the Windows and R key on the keyboard at the same time and it will open Run Command. 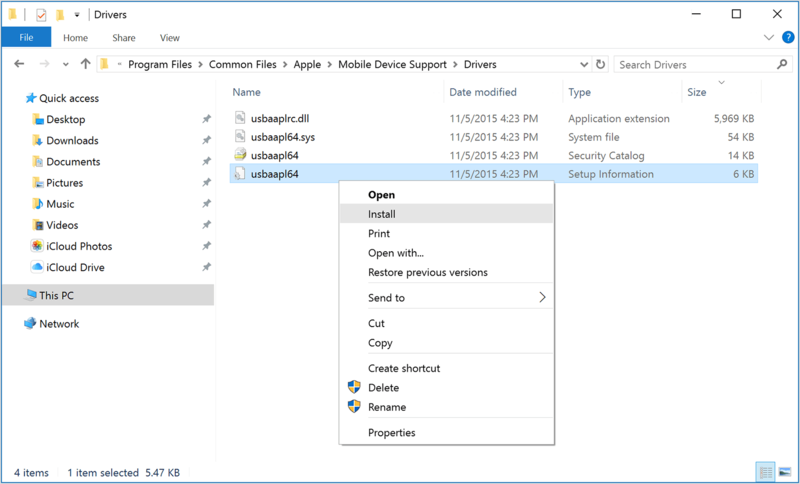 Step 4: Enter this in Run Window: %ProgramFiles%\Common Files\Apple\Mobile Device Support\Drivers. Step 6: Right click the “usbaap164.inf” or “usbaapl.inf” file. Select Install. Here make sure to install the files that end with .inf. Note: If you are not quite sure which file to install, right click on a black area in the File Explorer Window, choose View and then select Details to access the right type. You should install the Setup Information file. Step 7: Disconnect your iPhone and reboot your PC. Step 7: Reconnect your iPhone and open iTunes. Here we show you 4 common scenarios for “iPhone not connecting to iTunes”. If you are in the same situation, follow the corresponding solutions to fix. Case 1: iTunes detects iPhone, but it does not synchronize data. Reason: It can occur due to limitation of iPhone. Try this: On your iPhone, go to Settings > General > Restrictions and turn off the restrictions. Try this: Go to /var/mobile/media/iTunes_Control on your computer and delete the file folders. Restart iTunes to see it’s fixed or not. Try this: Completely uninstall iTunes and its related conponents, like QuickTime, iTunes, Apple Mobile Device Support, Apple Application Support, Bonjour, Apple Software Update, etc. Then reinstall iTunes. Go to C:\Windows and find the USBAAPL.SYS file. Right click on it, choose “Open File Location” and copy all files to a new folder. Open Device Manager (right click on My Computer and choose Properties), search Apple iPhone under the Portable devices. Right click on it to select "Update Driver Software". Close your iTunes and disconnect iPhone from PC. Go to C:\Program Files\Common Files and delete the Apple folder if it exists. Go to C:\Users\user name\AppData\Local and delete Apple and Apple Computer folders it they exist. Then go to C:\Users\user name\My Music and delete the iTunes folder if it exists. After that, reboot your computer. 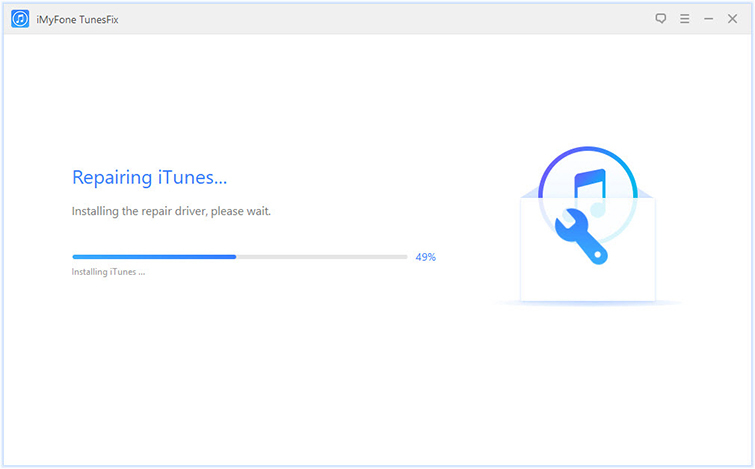 Once done, reinstall iTunes. Connect your iPhone and open iTunes to check. On your PC, right click on My Computer, choose Properties and select Device Manager. Find Apple Mobile Device USB Drive and right click on it. Choose Update Drive Software. Browse for the path: C:\Program Files\Common Files\Apple\Mobile Device Support\Driver. And check the software is updated or not. Reboot your computer. Connect your iPhone to see iTunes can detect it or not.